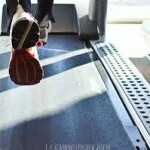 Cardiovascular interval training is a fun, effective way to burn calories. Interval training can be performed outdoors or inside the gym on stationary cardiovascular equipment. Interval training can be performed by a novice exerciser and yet will also challenge an advanced exerciser. The intervals can truly be whatever you want to make them. Consider intervals a workout by design approach to your exercise. The interval training principle is simple; work intervals followed by rest/recovery intervals. After a proper warm up of ten minutes begin your work interval. A work interval is performed at a higher intensity level than usual, your choice. Work just until breathing becomes challenging and you feel unable to continue at the same pace. This is where the rest/recovery interval begins. Decrease your effort and work at a lower intensity level, which allows you to recover and breathe easily again. When you feel about 50% recovered then it is time to begin the work interval again. The interval length will vary depending on the cardiovascular fitness level of the exerciser and desired goal. Novice exercisers should begin with intervals 30 seconds to 2 minutes in length, once a week. Perform as many work/rest cycles as desired based on your fitness goal. Follow your interval training with a cool down period to return heart rate to pre-exercise levels. Intensity can be monitored by heart rate (ask a fitness professional to calculate your target heart rate zone) or by rating your perceived exertion. Rate your perceived exertion on a scale of 1 to 10; 1 is no effort, 10 is your hardest effort. As your conditioning improves you’ll be able to work at a higher level of perceived exertion. Train safely and appropriately for your fitness level. Never work until you’re dizzy, light-headed or nauseous. Consult a physician before beginning any workout and perform at your own risk. Warm up for 10 minutes gradually increasing speed to maintain 3.0 mph. Start your Work Interval lasting for 2 minutes and performed at 3.8 mph, followed by a Recovery Interval lasting 2 minutes at 3.5 mph. Alternate between work interval and recovery interval for 10 minutes total. Finish your workout with a 10 minute cool down gradually decreasing speed from 3.5 mph to 2.0 mph until your heart rate has returned to its pre-exercise level. Warm up 10 minutes incrementally increasing speed to 3.0 mph. For the Work Interval increase elevation grade to a 4% incline, and maintain a speed 3.5 mph. 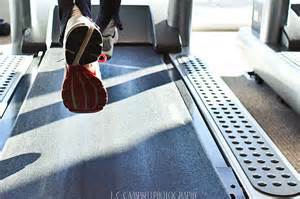 Move into a Recovery Interval with a 1% incline, and maintaining speed of 3.5 mph. Alternate between work interval and rest interval for 10 minutes total. Cool down slowly reducing speed from 3.5 mph to 2.0 mph, along with decreasing elevation grade gradually every minute or so until flat once again. The interval training principle may also be applied to the Stationary Bicycle through monitoring RPM’s or resistance level, as well as to the elliptical machine varying ramp or incline, resistance level or strides per minute settings. Outdoor walking or jogging cardio interval training is easily accomplished by simply alternating between a slow pace as defined by you and a fast pace (again at your determination based on effort and energy output) and monitoring distance via driveways, neighborhood blocks or property lines. Bicycling, walking, jogging, rollerblading, hiking, swimming, all provide fun interval workouts, limited only by your imagination. Interval training helps burn calories and build cardiovascular fitness all in one workout session. When the days get shorter and the weather colder, it’s no wonder we crave hot ‘comforting’ heavier foods to warm us up. Light refreshing summery salads just aren’t enough and can even leave us feeling cold! Think about what you did this time last year and how you felt. Did you over-indulge to the point of needing a new wardrobe? Or did you have a plan? We often reflect during significant times of the year, so trying to learn from past behaviour can only lead to a better outcome. Using warming spices is a great way to heat up, as well as encourage your body to burn fat. A few of my favourite ingredients are Turmeric, Cinnamon, Cayenne Pepper and Curry powder. I also add Ginger to my green smoothie and drink at room temperature. If you’re a tea drinker, warm lemon water cleanses your liver and perks you up in the morning, without the post-caffeine crash. Warmed unsweetened almond milk with cinnamon is a delicious alternative to lattes. You could even add a teaspoon of raw cacao for a healthy hot chocolate! So listen to your body and enjoy your seasonal adaptations!